Animal rights protesters link arms to block an intersection in the central business district of Melbourne, Australia, on Monday. Vegan protesters brought the central business district in Melbourne, Australia, to a halt for two and a half hours on Monday morning. In Queensland, activists broke into a slaughterhouse and negotiated the release of three sheep. The protests were part of a coordinated action intended to promote veganism and bring attention to conditions at Australia's factory farms. In Melbourne, "activists chained themselves to three Thrifty rental vans in the middle of the intersection, causing traffic chaos and affecting 11 tram lines. It also forced ambulances to take different routes to five major hospitals," The Sydney Morning Herald reports. Protesters also linked arms before the city's Sea Life aquarium. Protesters held signs that said "You have been lied to," as well as the URL for the documentary Dominion, which aims to "expose the dark underbelly" of Australia's factory farms and slaughterhouses. Police arrested 39 people in Melbourne, including a 15-year-old and two 17-year-olds. 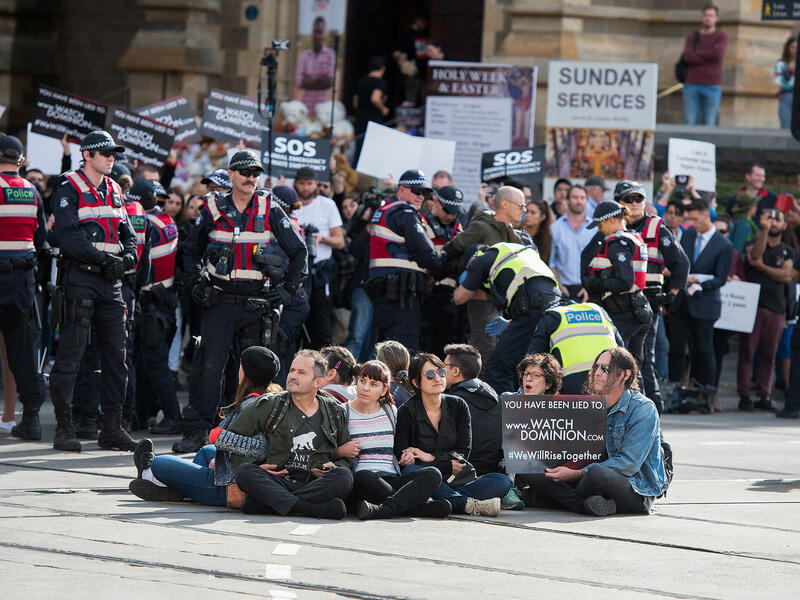 Police in the state of Victoria, where Melbourne is located, complained that protesters had not worked with police in advance and caused considerable disruption during rush hour. "Police are able to facilitate planned protests when we are engaged with which doesn't put the community at risk," Victoria Police Superintendent David Clayton said in a statement. "This lack of engagement puts the entire community at risk with road closures and delays to transport services. We respect the right for people to protest peacefully but we will not tolerate anti-social behaviour that disrupts the broader community." Slaughterhouses were the site of protests elsewhere in the country. Nine people were arrested for chaining themselves to machinery at an abattoir in New South Wales. In Yangan, Queensland, protesters arranged a deal with the owners of a slaughterhouse: The activists would unchain themselves and leave if the owners would hand over three sheep (which will now live out their days on a farm), and agree not to file a complaint with police. Australia is second only to the U.S. in the amount of meat consumed per capita. Vegan Rising campaign director Kristin Leigh told the Australian Broadcasting Corporation that the Melbourne protest was one of nine that were planned across the country. "We want people to go vegan, we want people to stop supporting animal abuse," Leigh told the broadcaster. "I don't believe any good person supports what's happening in slaughterhouses and so-called farms today, these are places of exploitation of innocent vulnerable beings. Animals are suffering in ways that most of us could never imagine. It's not about bigger cages, it's about animal liberation." Australian Prime Minister Scott Morrison rebuked the protesters as "shameful and un-Australian" and asked for authorities to bring "the full force of the law... against these green-collared criminals," the BBC reports. The country's attorney general, Christian Porter, called for two investigations: one into the protests, and another into an organization called Aussie Farms, which has posted an online map of Australia's factory farms and slaughterhouses. Porter also urged jurisdictions to consider increasing penalties for criminal trespass. "There are strong grounds to conclude that Aussie Farms Inc is engaging in a systematic effort in collecting, using and disclosing personal information to the detriment of farmers and agricultural producers," the attorney general said, according to the Morning Herald. The newspaper reports that the government reclassified Aussie Farms last week to make it subject to Australia's Privacy Act, under which organizations and individuals can be fined significant sums if they use personal information unlawfully.